Here Sean Antrim of The Mainlander interviews Sandy Garossino, who is running as an independent candidate for Vancouver City Council this November 19. Sean Antrim: You launched your campaign in the Georgia Straight attacking the affordability crisis in Vancouver. At the Mount Pleasant all-candidates debate, every candidate from every political party gave lip-service to this issue. I think that everyone recognizes that there is an affordability crisis in the city. In 2008, Vision Vancouver was elected on a platform that would address housing, homelessness and the affordability crisis, but we all know they have done little to tackle the problem. How will you address this issue, and what distinguishes your platform from that of Vision Vancouver? Sandy Garossino: Almost everyone that I have heard discuss this sees the affordability issue. I’m talking here about broadening this beyond homelessness and subsidized housing, but also market housing for the average working person. Almost everyone who talks about this, talks about it in the simple supply and demand equation, and their point is to increase supply. Because I deal with Asia, I understand capital markets in Asia, and I have dealings there, this seems to me to completely miss the true nature of the issue and the challenge that we confront. Just to give you a little bit of a background, our median income levels in Metro Vancouver place 20 out of 28 urban regions in Canada. Our median income levels for 2010 were below Sudbury, Windsor and St. John’s Newfoundland. We have the highest real estate prices in Canada, relative to median income. We have almost the highest real estate in the world. Relative to median income, we are 56% higher than New York City and 31% higher than London, so there’s clearly a serious distortion in the market. One of the first challenges we have is we don’t have the data. We don’t have information that can pin-point exactly what is going on and the extent to which capital is entering, and the extent to which that capital is non-resident, and how much that is affecting the market. We need to know a lot more than we do. But based on anecdotal information, which is turning out to be corroborated in news reports, it looks like global capital is having a massive impact. I don’t know if you saw the CBC report, where on Cambie Street bungalows were sold for an average of $3.4 million to a mainland Chinese buyer. So, this is a non-residential purchase, we know there is a flight of global capital. What most people, even many people in land development and even many people in government are not perhaps cognizant of, is the extent to which rules in other parts of the world are creating a funnel effect that is driving global capital here. The challenge is not that there’s inflow of global capital because in some ways it could be quite beneficial and benign, the problem is that it is pooling in a single asset class, residential real-estate, where there is a compelling public interest. We’ve got median income levels at Sudbury levels, and we’ve got average real estate prices that are twice the average of Canadian real-estate prices. When people are feeling that they are choking, it is because they are. It is not only choking individuals, it is choking small businesses, because there is no disposable income. Businesses can’t recruit people, they can’t recruit talent, and universities can’t recruit talent. It is corroding the entire local economy, which is primarily a small medium enterprise economy. So what to do? Sean Antrim: Bob Rennie, when he was recently speaking to the UDI, argued that it is not money coming from around the world. He looked at all of the property taxes were going out, and found that only single digit percentages of them were going to mainland China, or even just out of the country. Sandy Garossino: I was quite struck by that analysis, because if you or I own property in a foreign country, you would have a property manager in that local environment, and that property manager would take care of all of those things. It is completely irrelevant where property taxes were mailed to. We need better evidence. Anybody who lives on the West Side, as I do, knows how false that is. There are people in my community who describe that they are the only occupied house on their block. There are houses sitting empty. We have a situation where in the marketplace, we have excess housing. We’ve got residences, thousands of them, both single-family homes and condominiums sitting empty. Well, we’ve got a rental crisis. We need to start looking at the levers. And what can be done? I don’t have the answers because this is a really complex question, but obviously we don’t want to shock the market, because that would take a bad situation and make it infinitely worse. So my approach is to ask what are the surgical tools you could start to use. So on rezonings, if we are going to be doing spot-rezonings which at least in the short-term foreseeable future we will continue to do, those rezonings should perhaps be made conditional on all the units being occupied, regardless of who the owner is. Because off-shore owners frequently do rent out their property, and often when they do they rent it below market value, that can be useful. There’s no reason in the world that we should be rezoning properties to build towers that are not going to be fully occupied. Everything should be fully occupied. Secondly we should be looking at some of the solutions that other countries and cities have looked at like Singapore, which creates zones. Some zones are totally open for the international market, and some zones you can’t buy in unless you are a resident. Sean Antrim: I think that something like 80% of the housing in Singapore is public housing. It is owned by the government. Over the past thirty years they’ve built a massive amount of social housing, and this is what a lot of people are calling for, as a direct way to solve the problem right now. Real estate prices often don’t go down, and when they do go down they plummet. How about building social housing? People say that we can’t afford it. Sandy Garossino: My worry about going in that direction alone, although it’s interesting and I would be interested in looking at the model, is that we have to really look at the nature of Vancouver’s tax base. When you’ve got such a low median income, you don’t have a tax base. Our businesses are largely small and medium enterprises. We don’t have those mechanisms. We don’t have major corporations. We have very few head offices here. So is this something that could be done if we want to? I would be interested into looking at options around co-op housing. It’s something that we haven’t explored as a major initiative since the Granville Island and False Creek developments. They have really stood the test of time. We might overall want to get some more density in there to get more units there, but I really would like to see a return to that thinking, and to look at co-operative options. Again I wish I was a land economist, and I’m not, I am just a citizen who understands business, who understands economics and who understands global influences, and it is my position that government has to make this a first priority and they have to look at the cause, not just increase supply. Sean Antrim: Vision Vancouver’s main attempt to build affordable housing has been STIR, and STIR has been criticized as a policy that gives tax breaks to developers to build rental housing. As we’ve found out, STIR does not define affordability in relation to income levels, but rather market rental. I wonder what your position on STIR is as a means to build affordable housing? This also brings us to our second point: the introduction of a progressive tax. With past councils, there has been a shift of taxes from businesses to residents. COPE has called for a progressive tax, which means a change to the Vancouver Charter. There’s the option to initiate an empty-condo tax. Sandy Garossino: That is actually where we want to be looking. From my perspective, let’s look at the low-hanging fruit. Empty condominiums, and empty residents are investment properties, they should be taxed. If it is the case that business subsidizes residential housing, it should be subsidizing residential housing, not investment units. Investments should be taxed at the business rate. I would be looking for those kinds of mechanisms. We should be looking much more closely at the nature of capital that is coming in. It can be perceived as a threat because it is operating in a negative way, that has pooled so much. It is also an opportunity – one of the real interesting features of this capital is that, generally speaking, I think it is individuals, and they also have a tolerance for lower rate of return on income, lower return on investment, than the local developers. One of the challenges of STIR is that local developers actually want a decent return, or a lot of return, on their investment. That is really difficult when you have really high bank costs, but actually the non-resident investors are prepared to live with empty-units. Return on investment is not their primary objective, they are looking for something else. We should be looking to channel that investment into rental housing, channel it into financing some of these more innovative situations. Sean Antrim: Bob Rennie has talked about “social housing condos” as people buy them as investments, I’m not sure if that is what you are talking about? 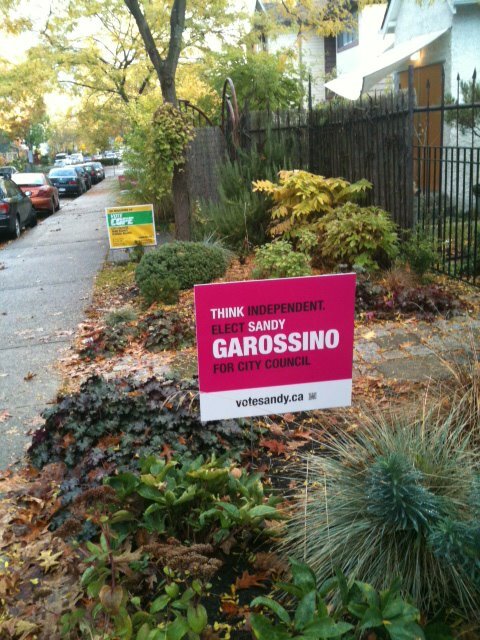 Sandy Garossino: I am thinking in concept. I think we actually need all of the players at the table, we need developers, they do understand planning costs, and we need everybody at the table, rolling-up their sleeves and really saying “OK, we are going to crack the code on this,” and we’re going to find solutions that are not going to destroy the equity that recent young buyers, the last thing they want is anybody who is actually able to shoehorn themselves into a property and for them to lose their house because we have a crash. We can’t have that. Sean Antrim: If you listen to developers, they state that the only place for development to move is “eastward.” At the same time, what they are doing is demolishing affordable rental housing for low-income Vancouverites. This is a big problem. A good way for developers to maintain inflated costs is by demolishing affordable housing. I wonder what your perspective is on the specific case of development on the DTES? Take for example Chinatown, many older, senior citizen Chinese are watching their affordable housing stock disappear. Sandy Garossino: Well neighborhood preservation and character, that is the essence of Vancouver. Look at Chinatown, that is a national treasure as it sits right now. I look at the loss of the Red Gate and the loss of all of those enterprises in those areas, we are erasing our history and we are forgetting so easily where we come from. All of these things are wrapped up in these questions. I do not have the solution. My concern is that we get really imaginative. I come from TED-community, that is my ethos. I believe in imagination. I believe in innovative and creative solutions. It is no surprise to me that there was just recently one of the really practical problems in AIDS research that scientists hadn’t been unable to crack for 20 years, they put it to the gaming community, and the gaming community solved it in three weeks. This is the kind of thinking we need to bring to this problem, and very often when you return to the same area and you ask the same questions from the same people, it is no surprise that we get the same answers, it is my concern that the developers who have a legitimate and real interest in this conversation, are dominating the conversation, and we are loosing these really critical other pieces. I would love to be able to say I got the answer, but as I said in my piece in the Georgia Straight, I am not there. I am not the specialist, I am not the wizard, but I know that we can do this. And one of the real keys here is to look at this inflow of international Capital, as an opportunity that buys us some maneuvering room, if it is channeled in the right way. That is the biggest problem, no one is looking to channel it in positive ways, get it into local business investment, get it into venture capital where it can be funding part of our knowledge economy, and building and creating jobs, that is where we need that capital, and we are not getting it. We’ve got to look at that. Sean Antrim: You have served on a number of different art-institutions Boards. In Vancouver there are a lot of art spaces that are under erasure, especially under the threat of real estate speculation. If you go to the corner of Carroll and Hastings, Centre A, an internationally recognized institution has a ‘for lease sign’ on their building, there are also a lot of other artist-run spaces who are paying too much money for rent, and they are looking for new spaces. For Vision Vancouver and the NPA, the way they build artist-run spaces is through Community Amenity Contributions but this does nothing to protect existing spaces. Now the critique from artist communities, is that CAC’s are poorly-funded, restrictive, blank concrete-cubes that are incapable of providing adequate space for artists, then you couple this with the fact that there are a number of affordable artist-run spaces that are being torn down. What is your strategy to fund these projects as well as maintain Vancouver’s dynamic artist-run culture so that it is not displaced entirely. Sandy Garossino: I see this in the broader context, in cultural context. The real cause of the problem, is that real-estate prices are off the charts. Being able to fund small boxes and little spots here and there is not how you instill energy and dynamism in a cultural community. My daughter is an artist living and working in Montreal. She is in the music scene, she is rising. Things are happening there. Why? It is not because of her space, it is because she is around other exciting artists and musicians. They have a a whole scene there. It is not a typical postal-stamp place that is affordable. It is about having an environment which is artist-friendly, where it is possible to be an artist where other artists want to be. I am reluctant to weigh into this discussion, talking about policy around space. This is really a policy around culture. Concrete small ‘c’ culture, our community culture. I am a dedicated, go-to-the-wall for artists advocate, but in that way, I don’t see the artists, in particular, as a special case. They are suffering in the same way as the child care workers are suffering, and the nurses are suffering, and anyone who is working here. It comes back to affordability for everybody. It is not only about activity space. We are in a severely challenged environment, and we need to get to the bottom of it. We might look to zoning for preserving areas, because it is not an answer to just to say, “we need to worry about our culture,” we are loosing the Red Gate, we are loosing these spaces. A place like the Or Gallery only survives because we have a landlord who is dedicated to preserving these spaces. I do think that council has a role to play, and public culture services and the planning department have to really put culture out there as a huge priority. The biggest thing is that they ought to be aware when the red gate is on its knees, the planning dept. should acknowledge them, there should be those conversations and relationships. A lot of it is not about rules, but about having the conversation behind the scenes. 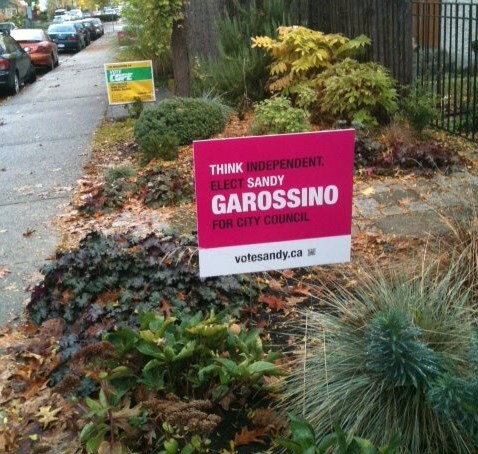 Sean Antrim: Why should people vote for Sandy Garossino on November 19th? Sandy Garossino: Because we do need to get new voices in and, in particular, if you look at the development issue, there’s just a huge amount of money being poured into the parties and we need to have much more wide-open ability for interesting people to come forward. The other reason is that I will attack this affordability issue, and I’m going to get right to the heart of it, and not tinker around the edges and say there, we’re done. We’re not done until people can afford to live in this city. Posted in Analysis, City Hall, Election 2011, Housing, Interview, Uncategorized. Bookmark the permalink.